I’m not really sure where the time’s going these days. It’s been sort of work work work sleep work work work lately, not in a bad way, really, but there do seem to be a few more plates spinning than I’m entirely comfortable with. Friday is the Lincoln’s Birthday holiday which is The One True Day Off (CUNY is closed, public schools are open, boo yah!) so I’m hoping to put 1 or 2 plates down then. One of the things I haven’t been able to get to lately is making a new phone cozy. As always happens with my sewn things (with anything cloth, I guess), it needs to be replaced about every 6 months. To its credit, I do take the phone in and out of it and take the whole shebang in and out of pockets and bags and backpacks seemingly a million times a day, so it’s not surprising to have to replace it that often. Tonight I thought I could be clever and just snip away at the fraying outer layer, exposing the not-fraying-yet corduroy within, but I’d forgotten that I had a slight alignment issue when I sewed it all up and the corduroy wasn’t actually attached to one side. Oops. Into the cloth recycling bin with that! Crappy picture, but you get the idea. I turned it inside-out, sewed up the bottom, turned it rightside-out, wove a short length of purple ribbon through the top, and there you have it. It’s not a permanent solution by any means, because glass on phone + fuzzy cashmere = slippery and I am too clumsy for that. But it’ll do until a few plates have slowed their rotation. You may have heard about this newfangled invention the kids are all crazy over: text messaging. For the longest time we did not have free texting on our phones. Mostly it was stinginess thriftyness: I don’t like talking on the phone at all, but I also couldn’t really fathom that I would text enough to make it worth the money. Plus it bugs the hell out of me that we can have 40 million billion jillion unused phone minutes (see above re: my dislike of telephone communication) BUT the phone company has the gall to charge us, charge us!, for texting. Harrumph! Get me my tin cans and string, you whipper-snapper! It was sometimes hilarious not to have a texting plan. Occasionally I get wrong-number texts, which are even more annoying when they cost $0.25 a pop *and* when the sender refuses to believe that you are not her/his friend. But now that we have a text plan, I can get into true identity SMS fights with ease! I guess it was one text too many, but one day I said, “hey, maybe we should get a text plan.” And thus it was to be, and verily, we were texting by nightfall. Mostly I just text Jonathan. Thanks to the fabulous iphone emoji app, we can also send each other tiny pictures of hearts, clouds, food, drink, and smiling poop (scroll down on that page for the poop). But recently I’ve started to text others more and more. My siblings + parents, esp. over the holiday. Pals, esp. when I am running late. Tonight was a breakthrough — Jonathan texted a new babysitter we’re hoping to engage, and I was texted by one of Gus’s friend’s parents. OMG this texting is amazing! No putting off phone calls forever because I don’t want to make them, no awkward small talk is possible in 160 characters. Texting FTW! I had a whole post ready to go that I wrote half one night last week and half yesterday morning at Gus’s karate class, but then things got busy in the afternoon and we had pals over for dinner and I forgot. But it’s Valentine’s Day, so I can’t use that post today because it’s imperative that I remind you to get yr candy hearts for yr sweetie here, at my sweetie’s fab site, which this year is beating out even NECCO (the actual candy company) in the Google search results for “candy hearts.” w00t! I’d also like to take this opportunity to plug the release of my sweetie’s newest fab project, Beautiful Tarot, truly the most gorgeous tarot iPhone app out there on the intarwebs. Hip hip hooray! Today I finally finished my new iphone cozy. I did most of the work 2 weeks ago, but finishing the edges has lingered on and on, mostly because it involved lots of hand-stitching. But I am really quite pleased with the result. Like the last one, this cozy has a thicker inner lining (in this case, felt) with thin fabric on either side. I used ribbon for the edging again. 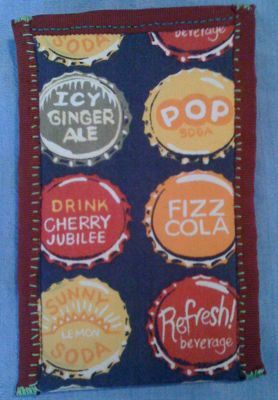 It took forever to hand-stitch but I think it looks pretty nice this time. I used darker fabric and ribbon because lighter ones in the last version got dirty pretty quickly. There are definitely a number of improvements in this iteration. For the last one I cut out 6 rectangles of fabric, layered them appropriately and machine-sewed on 3 sides. Then I couldn’t get the top ribbon edging to work because the external seams got in the way (and also had a frayable bottom seam to deal with). 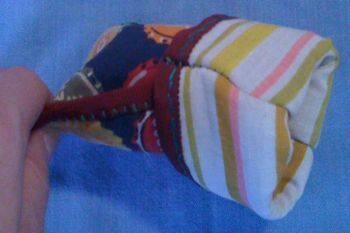 For this one I cut 3 long rectangles of fabric and folded them before machine-sewing the sides (voila: no bottom seam). 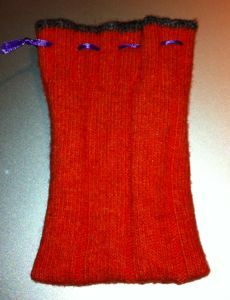 I stopped short of the very top, then hand-stitched the ribbon onto the top edges. Then I hand-stitched the ribbon on the sides; it’s mostly decorative, but also served to sew up either side at the top where I’d stopped short with the machine. I also remembered the old trick of halting a fraying edge of ribbon with a few drops of clear nail polish. I can already see the improvements to the next version. All that hand-sewing is a drag — I have to figure out a way to machine-stitch the top edge ribbons on. They’re so slippery, though, that it’ll be rough going. I also need either thicker ribbon or to trim the fabric edges along the sides a little closer to the seam, because sometimes the seam stitches peek out from under the ribbon. And I need to figure out how to hand stitch the tops and bottoms of the side ribbons more neatly. But all in all I think it’s a good effort. Go me! And now I have another useful skill, should I ever need it. 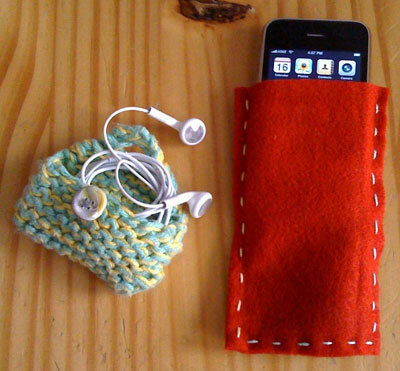 Because in the 21st Century Great Depression *everyone* is going to need an iphone cozy! Ah, Summer Fridays. The days I’ve scheduled for publication-related activities. Last week I had a good workday, but today I am far less motivated. I’m still not 100% recovered from my surprisingly evil head cold. And I feel like I didn’t get enough done this week, what with the 2 sick days. I guess I did finish two books while convalescing (one of which had been moldering on a shelf, half-read, since the spring!). But I’d like to have gotten more done at work, run some errands, cleared out some Coop work, etc. So, today I would much rather be doing non-publication-related things. But there’s not an infinite number of Summer Fridays, so instead I’ve planned procrastination until 10am (hence this post!) and work after that. Two shiny new gadgets arrived in our house this week. I know, I know, I’ve claimed at least twice that I would not be getting one. BUT, someone in the house joined the iphone developer’s program and needed a testing platform. Also, our old cellphones were really bad, practically unusable, and since our contract was up we would have needed to pay for new phones AND get a more expensive contract anyway since they no longer offer our old plan. And it’s not fair for just ONE person in the house to have an iphone, now, is it? Admittedly, it still makes me a bit nervous to carry it around. I did bring my old ipod shuffle to work the other day because it seemed conspicuous to be listening to music on the iphone in the subway. But I have to admit that it’s pretty sweet. I stitched up a quickie cozy for it out of some felt I had lying around, but I’ve plans to sew a real case sometime soon. And the headphones fit perfectly into the little knitted cozy that Anne made for me ages ago (thanks Anne!). I haven’t paid for any software for it yet, but I downloaded a free Othello, because I am a nerd. Now if someone could just make a (GOOD!) listmaking app and Tesserae, I’ll be all set!